, an organization that strives to help non-profits use technology more effectively. In each session, members of our team will cover a specific topic for grant recipients, ranging from the basics of a Grants account to evaluating account performance with tools such as Google Analytics. Note that the series does have a fee associated with it, though you can register for individual sessions only if you prefer. Registration and more information are on the NTEN website. We hope you can make it. We're excited to announce a 5-part webinar (online seminar) series about Google Grants! It's running from September to October and being hosted by the Nonprofit Technology Network (NTEN), an organization that strives to help non-profits use technology more effectively. In each session, members of our team will cover a specific topic for grant recipients, ranging from the basics of a Grants account to evaluating account performance with tools such as Google Analytics. If you regularly read our blog, we hope you're building a solid understanding of the Grants program. One great way to further develop your expertise and share your knowledge is to use the Grants Help Group, where non-profits post questions and share information about the program. You can not only learn more for yourself but also help fellow and potential grant recipients with their questions. So go ahead and show off your stuff! Your fellow grant recipients will appreciate it, and you'll likely build even more expertise for yourself along the way. we presented a TechSoup webinar (online seminar) that covered the basics of the Google Grants program, how to create effective Grants AdWords accounts and resources for managing your Grant. It was a fairly quick presentation (less than 1 hour) with some lively discussion about topics ranging from managing your quality score and submitting a successful application to installing Google Checkout on your site and how to qualify for additional budget. In addition to the Google Grants information covered during the webinar, Kevin Lee at Didit.com presented some valuable SEM (search engine marketing) resources and guidance that would be helpful to any non-profit working on online marketing initiatives. If you'd like to be alerted about upcoming Google Grants webinars, you can subscribe to our RSS feed for future webinar announcements. Last week we presented a TechSoup webinar (online seminar) that covered the basics of the Google Grants program, how to create effective Grants AdWords accounts and resources for managing your Grant. about her volunteer work with Google Grants, I'm an AdWords team member who also contributes to the Grants team. I work in our Dublin office, Europe, the Middle East & Africa's Headquarters, on our UK & Ireland Education team, and I’m also on the Grants team for the UK & Ireland. In reality, Grants is addictive, so it also takes up about 20% of my non-working life! Working on Grants has given me the chance to contribute to our mission—as Larry and Sergey wrote in their Letter from the Founders, "We aspire to make Google an institution that makes the world a better place." And I've been able to breathe my own ideas in to how we achieve this goal. One of the things I'm most proud of is a recent endeavor, which transcends traditional geographical boundaries and conveys how unique a company Google can be. Whenever we see TV ads about disasters such as those in Sichuan or Burma/Myanmar, it can be hard to think of how we can help. Working with some key aid organizations, we were able to reduce the time it takes to get free AdWords ads online, through Grants, to help people wanting to donate online. As a result, we helped the Tsinghua Foundation become one of the fastest responders to the recent earthquake in China. Their organization didn’t exist before the event, but they managed to collect a significant amount of donations within days and through the following weeks. It’s uplifting to think that I could make at least a small contribution, from Dublin, to an NGO in California helping people in Sichuan. 1) Relevance – Avoid using overly generic terms. With a $1 CPC, you want to make sure your keywords are active. The best way to do this is to: a) choose terms specific to your organization and its work; b) see which terms you use on your website and offline marketing materials and c) see who's searching for which keywords using the AdWords Keyword tool in your account. 2) Planning – Think of the core two things needed for a successful online campaign. First, what are we promoting on our site? Second, which campaigns are we running at the moment? If you plan the account before you start creating or optimizing (I usually use a spreadsheet), you'll be able to separate each issue or campaign into separate themes (i.e. the different functions your organization performs). I'd then create one ad group per theme. For example, let's say I’m an organization working to provide disaster relief aid. I operate in two countries (Country A and Country B), and I offer food aid in Country A and medical aid in Country B. To ensure my keywords are relevant to my ad texts, I'll create a campaign for each country I work in and target them to relevant audiences. For Country A, the ad text "Food Aid Country A" will have themed keywords such as 'food aid organisations' and 'aid country a' etc. I can then divide each Ad Group in to the service I run, for instance, "Campaign: Country B," "Ad Group: Medical Aid " for medical aid in Country B, with different ad texts and keywords for "Campaign: Country A", "Ad Group: Food Aid". 3) AdWords Editor - This is my number-one tip for grant recipients. AdWords Editor is a free campaign-management application, where you can see your account as an overview, avoid duplicating keywords and save so much time creating and optimizing campaigns. You can even take previous campaigns, copy and paste them and alter the content. I hope these tips help, as our core mission at Google Grants is to help organizations get the most out of their AdWords advertising and promote their cause. Many of those working for the organizations we help are volunteers full time; a US Government study showed that in the US alone volunteers worked 8.1 billion hours in 2007 for non-profits. I can't guarantee I'll beat that total on my own, but I hope to contribute more to Google's! Like Yvonne, who wrote recently about her volunteer work with Google Grants, I'm an AdWords team member who also contributes to the Grants team. I work in our Dublin office, Europe, the Middle East & Africa's Headquarters, on our UK & Ireland Education team, and I’m also on the Grants team for the UK & Ireland. In reality, Grants is addictive, so it also takes up about 20% of my non-working life! If you notice that a couple of your keywords perform well and receive many qualified clicks, try entering them in the Keyword Tool to find similar ones. Or if some of your keywords haven't received many clicks, try entering them in the tool to see if there are synonyms or related keywords you could try. This article has additional tips for using the tool. The Ad Preview Tool allows you to see your ad as it would appear on Google (without accruing extra impressions which can negatively impact your clickthrough rate). This helps if you're targeting a specific geographic area where you aren't located. To preview your ad, simply enter a keyword and click on 'Preview Ads' to see the Sponsored Links and results for that keyword. The Ads Diagnostic Tool is great for seeing an ad's behavior. To use it, simply enter the keyword you're searching on. The next page will give you information about the keyword and reasons that your ads aren't running. There's also an option here to preview search results through the Ad Preview Tool. The Disapproved Ads Tool, which compiles all ads that may be disapproved. You can see why ads have been disapproved, so you can edit them accordingly to get them up and running again. The Change History Tool shows you changes (such as adding or deleting keywords, or creating new ad text) that have been made to your account. Finally, there's the option to download AdWords Editor, which we'll post about next month. It's a useful desktop application that helps you manage your account and make changes offline. If you want to get a head start, go ahead and download the desktop application here. Otherwise, get to work on the tools above. Have you ever wondered why you couldn't find your ads if you searched on Google? Have you wanted to add a few keywords to your campaign but not known what to add? That brings us to the Tools section of your Grants account. 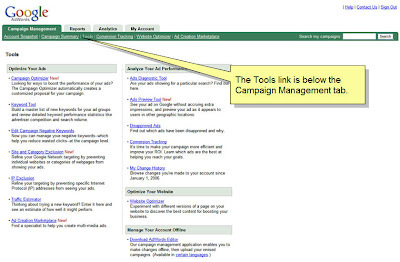 In the Campaign Management tab of your account, the useful Tools section can help you easily optimize your ads and analyze their performance. Include an intro to managing your org's Google Grant with any new hire training you do. Give them access to your centralized grant information and let them know how you're using it to benefit your org. Ask them what they would search on if they were searching for your services and consider their ideas for expanding your keyword list. Schedule an account report in AdWords to occur bi-weekly and be emailed to your email address. Advertise events and set campaign end dates so that you don't have to worry about turning your event campaign off once the event has passed. If your org has developed other ways to make the most of your grant, please feel free to share them with our team and other orgs in the Google Grants Help Group. As you know, you're in control of your Google Grants AdWords account 24/7 and understanding and following the program guidelines will contribute greatly to your success in the program. But we also wanted to give you a quick list of other things you can do to get the most out of your Google Grant and keep your account in good standing for the long term. Alert the Grants team of any relevant personnel changes on your staff. This can include new hires, people changing roles and upcoming leaves. Email googlegrants-support@google.com and include the new contact information and any pertinent details. Example: John Smith will be the new contact for all matters concerning our Google Grant. Contact him at john.smith@yourorg.org. Make others at your organization aware of the award and your active Google AdWords campaigns. Put all your Google Grants related information in one spot and make sure everyone at your organization can access it. Good things to include might be your org's AdWords login email address, password(s), account number, notes on account history and goals, analytics account information, your org's contacts for invoices, technical issues (analytics) and general correspondence, grant amounts and recent changes in your grant. You could even use a Google Spreadsheet to centralize this information online and make it accessible to everyone in your org, regardless of their location. Identify someone in your organization who can be the go-to for your grant. This might be the person who already manages your marketing or communication activities, an existing grant manager or someone who's got some online savvy. Thinking along the lines of centralizing your information, finding one person in your org who is actively engaged with your grant can ensure that communications get to the right place and information is easy to find. Finally, users who click on your ad should be taken directly to your site's most relevant page, called a landing page. By grouping your keywords and ad text in themed ad groups, you can choose the most relevant page. Ideally, a user who clicks on an ad promoting "facts online" go directly to the page displaying that information. Regardless of the tactics you try, check on your campaigns regularly once you've made adjustments. See how your ads' performance changes and whether you can make other changes to further improve it. And if you're curious about what other grant recipients are doing with their accounts, visit the Google Grants Help Group to discuss ad groups and post your own questions or methods for others. We get a lot of questions about how to organize campaigns to get the best results. Of course, there's plenty that goes into this secret sauce, but a few things always hold true. First, grouping your keywords by theme is a good start to any ad group. If you offer a way for people to make donations on your site, for instance, you can create a "Donations" ad group and fill it with keywords that relate specifically to donations, such as "Charitable donations," "Online donations," or "Donate to charity." When people search for "Donate to Charity," they will see your highly relevant ad text and be more likely to click through to your site. Also, when your ad text matches the search query, your headline will be in bold and will stand out to users. account? Want to get tips directly from our team? Then join us for a TechSoup webinar (online seminar) on Thursday, August 14, at 11 a.m. PDT. To get more info and to register, visit our information page. For more details about TechSoup, an organization that provides non-profits with free technology information, resources, and support, visit their homepage. And if you can't attend the webinar or would like to learn Google Grants tips for success on your own, check out our newly redesigned Help Center. Want to learn more about how to maximize your Google Grants account? Want to get tips directly from our team? Then join us for a TechSoup webinar (online seminar) on Thursday, August 14, at 11 a.m. PDT.